Just what is To Say Nothing of the Dog? 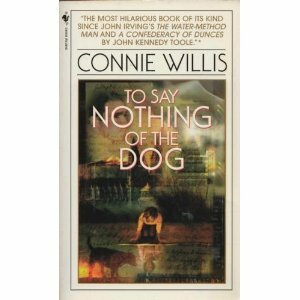 First, it’s a book by Connie Willis. Second, it’s what you get when you cross the time-traveling science fiction of H.G. Wells with the cleverness and humor of P.G. Wodehouse. It’s quite a hybrid, but it works from beginning to end. The year is 2057. Lady Schrapnell – a rich and imperious old dowager – has invaded Oxford University’s time travel research project, promising to provide funds for it if they assist her in restoring Coventry Cathedral, a grand old building destroyed by a Nazi air raid way back in 1940. She bullies almost everyone into the program, forcing them to make “jumps” back in time to locate particular items. Enter Ned Henry, a 21st century Oxford history student. When too many jumps leave him suffering from a severe case of time lag, a relaxing trip back to Victorian England seems like the perfect remedy. His mistake. Complexities like missing cats, incongruities in the time continuum, and love at first sight make Ned’s “holiday” anything but peaceful. To say nothing of the way an extraordinarily hideous bit of Victorian art can alter the flow of history. if [the three men] were just now on their way upriver, Three Men in a Boat must not have been written yet. I hoped when it came out, Terence wouldn’t read the copyright page. The literary allusions don’t stop there, either. Nods to geniuses of the likes of Agatha Christie, Dorothy Sayers, Wilkie Collins, and Arthur Conan Doyle abound, adding even more fun and humor to the story. The characters are delightful. Ned Henry is a likable everyman-type hero who finds himself caught up in a whirlwind of crazy events, dashing to pieces any hopes he had of getting some good R and R. Verity Kindle is a sweet and sometimes impetuous heroine, and you can’t help hoping she and Ned will get together in the end. The cast of sub-characters, including a hapless bull dog named Cyril, is equally well-conceived, and each one serves a unique purpose in Willis’ comedy of errors (and manners). As far as content goes, there’s little to be concerned about. Foul language is used very infrequently, and when it does occur “damn” and “bloody hell” is as bad as it gets. A few mildly suggestive remarks are made; and in one scene, Ned learns that his Victorian friends have a marked aversion to openly discussing “the facts of life”. (The scene is actually quite tasteful and written in a humorous, lighthearted way). So, if you’re looking for hysterical comedy with a serious edge, pick up To Say Nothing of the Dog. It is, simply put, brilliant. I’m sure I’ll be picking it up again very soon to enjoy a second romp through Willis’ fantastical tale. In chapter 5 of Basic Christianity, John Stott offers some helpful insights on the nature and meaning of the Ten Commandments. I think his thoughts are well-worth considering; too often we have a tendency to merely glance over God’s law without truly considering what it says and how it should impact our lives. “If the first commandment concerns the object of our worship, the second concerns its manner. In the first, God demands our exclusive worship, and in the second our sincere and spiritual worship. For ‘God is a spirit, and those who worship Him must worship in spirit and truth’ (John 4:24).” Although we may have never made a graven image with our hands, what gruesome mental image have we conjured up in our minds? And although this commandment doesn’t prohibit the use of all external forms of worship, it does imply that they are futile except there be inward reality as well. “We may have attended church; have we ever really worshipped God? We may have said prayers; have we ever really prayed? We may have read the Bible; have we ever let God speak to us through it and done what He said?” It is pointless to approach the Lord with our lips if our hearts are not sincere (Isaiah 29:13; Mark 7:6). “The name of God represents the nature of God… His Holy Name can be profaned by our loose language and most of us could do worse than revise our vocabulary from time to time. But to take God’s name in vain is not just a matter of words, but also of thoughts and deeds.” Whenever we our actions are contradictory to our beliefs, or our practice is not aligned with what we preach, we take God’s name in vain. If we call Him “Lord” and then disobey Him, we are taking His name in vain. If we call Him “Father” and then doubt Him, we deny His name. This is hypocrisy. This is sin. Stott points out, “To set one day in seven apart is not just a human arrangement or a social convenience. It is God’s plan… Man’s body and mind need rest, and man’s spirit needs the opportunity to worship. The sabbath is therefore a day of rest and worship.” We are not only to keep it as such ourselves, for our own well-being, but we are to do everything we can for the common good to make certain that others do not have to work needlessly on this day. Sunday is holy, set apart unto God. It is His day, not ours. Therefore, we are to spend it in His way, and not in our way; we are to use it for His worship and service and not just for our own selfish pleasures. “… our parents, at least while we are children, stand towards us in loco Dei: they represent God’s authority. Yet often it is in their own home that people, young people especially, are at their most selfish and inconsiderate.” It is too easy to be ungrateful and negligent, and to fall short of giving our parents the respect, affection, and honor they deserve. It is important to understand that this commandment does not just prohibit outright murder. “If looks could kill, many would kill with a look. If murder can be committed by cutting words, many are guilty.” In fact, Jesus clearly stated that to be angry with someone without a cause, and to be insulting, are matters just as grave. John writes, “Whoever who hates his brother is a murderer” (1 John 3:15). “Every loss of temper, every outburst of uncontrolled passion, every stirring of sullen rage, every bitter resentment and thirst for revenge – all these things are murder. We can kill by malicious gossip… studied neglect and cruelty… spite and jealously. We have probably all done so.” Note that this commandment also forbids the taking of one’s own life. Since God controls all things, and has chosen each person’s circumstances, to commit suicide is to rebel against His authority. “… this commandment has a far wider application than just to unfaithfulness in marriage… This commandment in fact embraces every abuse of a sacred and beautiful gift from God.” It means that we are to be holy in heart, language, and conduct. We must avoid reading or watching impure things; speaking or jesting in a coarse, unseemly manner; or acting in any way that would compromise one’s own purity or the purity of others. 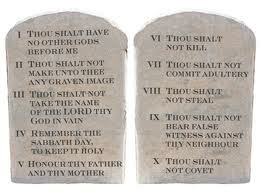 “The tenth commandment,” Stott concludes, “is in some ways the most revealing of all. It turns the decalogue from an outward legal code to an inward moral standard. The civil law cannot touch us for covetousness but only for theft. For covetousness belongs to the inner life. It lurks in the heart and the mind. What lust is to adultery and temper is to murder, that covetousness is to theft.” When a man covets, he not only breaks this commandment, but the first commandment also. He is allowing his desire for someone else’s property to usurp the place of God. This is idolotry (Colossians 3:5b). By contrast, Paul tells us in 1 Timothy 6:6 that godliness with contentment is great gain. The recently released sci-fi thriller Source Code was, I must say, quite a disappointment. 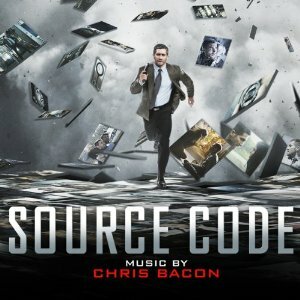 Fortunately, the movie’s score – composed by newcomer Chris Bacon – is not. In fact, it will probably rank among the best soundtracks of 2011. Bacon utilizes a predominantly traditional orchestra with just a sprinkling of electronica, imbuing the music with a classic, noir-ish feel reminiscent of the great film scores of the 60s and 70s. I’m usually wary of newbie composers, but Chris Bacon is an exception. He shows a lot of promise, and I’ll be keeping an eye out for him in the future. Main Titles gets the album off to a suitably dramatic start and introduces one of the album’s major themes. Coffee Will Have To Wait moves along quietly until the 1:10 mark, at which point it explodes into heart-pumping action. Track seven, Piecing It Together, is energetic and suspenseful; conversely, Frozen Moment is a quiet piece, culminating in a crescendo of beautiful string writing and effectively fleshing out the love theme. Last, but not least, is Everything’s Gonna Be Okay – a reprise of the Main Titles, but with a few twists of its own. Buy the MP3 album on Amazon.com or iTunes. Atlas Shrugged Pt. 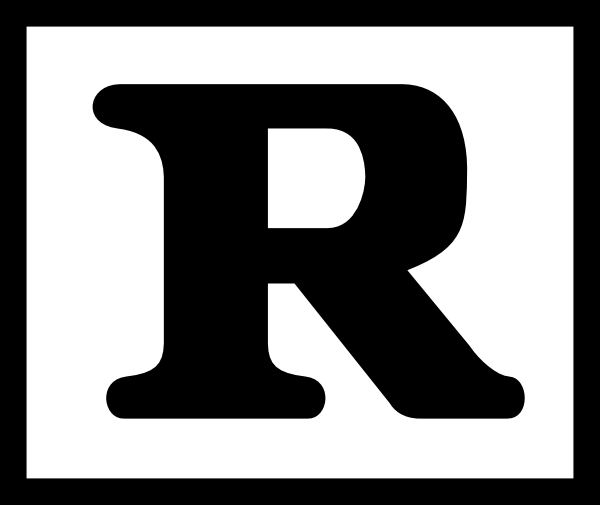 II – Santiago discusses the machanics of Ayn Rand’s dystopian novel. But first, read this. What If The Lord of the Rings Had Been Written By… – Persis gives us “Follies and Nonsense”… LOTR version. Oh, yeah. Spinning Wheels – Check out the newly released “Circular Tandem Bicycle”. Ain’t it sweet? Now let’s find some Mormons.